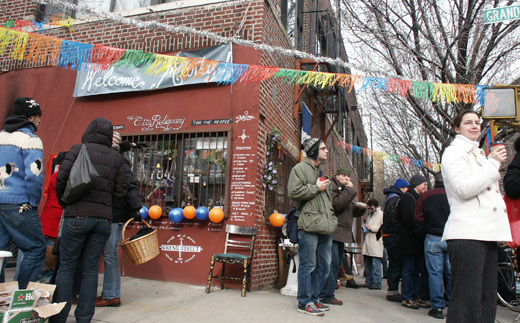 If you've walked around Williamsburg, I'm sure you have noticed the City Reliquary, at the corner of Grand and Havermayer, a window display of NYC ephemera, with audio explanations. On February 23 at 7:30 (doors open at 7) they are hosting an event described as Collectors' Night at Union Pool, at the corner of Union and Meeker Streets under the BQE, Williamsburgh, Brooklyn. I'll quote the press release. And displayed collections of all kinds. On Wednesday night, the City Reliquary is honored to present Collectors Night, a celebration of unique, fanciful and eccentric collections, presented by the people who collect them. The program will feature audio from the Sound Portraits' StoryCorps project, films about collecting and that serve ascollections, and a panel discussion moderated by Long Island University English Department Chair Leah Dilworth and Q&A on collecting and collectors. Collectors' Night will also feature the personal collections of postcards, vintage bicycles, bottle caps, baseball cards, geological artifacts and anything else deemed collectable by those in attendance. Published on February 18, 2005 11:17 PM.